I re-watched this little clip featuring one of the leather craftsmen, that work for Hermès. And I have to say, that I find it very meditative, plus it made me want to do some leather work, which I can't find the time to do at the moment due to obligations at school. The type of stitching is called saddle stitching and it dates back hundreds of years. It is a very strong stitch, that you use, when hand stitching leather. 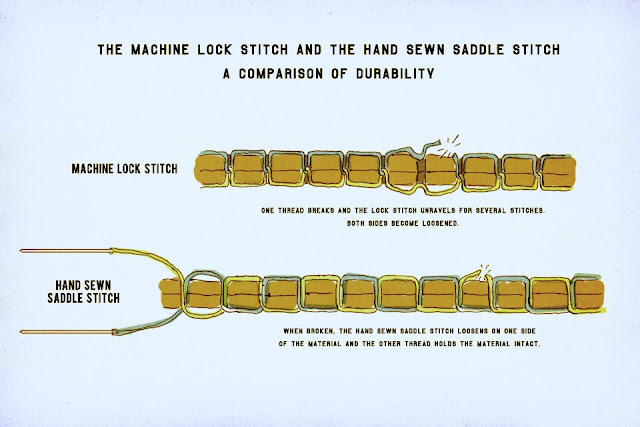 It is way stronger than a machine made stitch, in case you are wondering. This diagram will explain it faster, than I'm able to. But if you have any questions regarding leather, leather crafts or want to learn about it, let me know, and I'll try to help. I hope this will give some of you a better understanding of, why handsewn leather is so much better and why it costs more, as it is quite time consuming, because very few are just as fast as the Hermès craftsman. Friendly Fire - Dad Rocks!